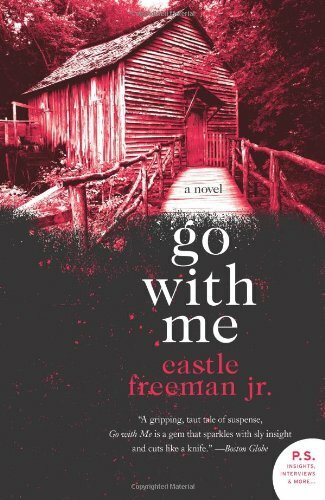 Go With Me – Castle Freeman Jr.
Lillian is a young woman who has recently moved to a small Vermont town. Early one morning, the town sheriff finds Lillian asleep in her car in the police station parking lot. She’s come for help. The town thug, Blackway, has been harrassing her; has, in fact, driven her boyfriend out of town and killed her cat. The sheriff’s advice is simple: go home. Blackway is an enigmatic, altogether menacing, figure. The sheriff himself is afraid of him. “You could put it that way, I guess,” the sheriff said. The sheriff’s advice is to head over to the mill and find Scotty Cavanaugh because “he and Blackway have had dealings.” But Cavanaugh is not at the mill and instead Lillian solicits the help of the strange, quiet brute, Nate, and an old man named Lester to help her find and confront Blackway. Go With Me is the strangest book I’ve read in a long time. It is both laugh-out-loud funny and strangely creepy. The book tracks Lillian and her small posse to various places where they might find Blackway, breaking the tension of their search with the commentary of the men at the mill who wonder – Greek chorus style – at how it might all turn out. Blackway, as it turns out, is not a man to be trifled with. He deserves his reputation. Lester is resourceful, though, and Nate “ain’t scared” and this slim book rockets along to its shocking climax. I’d never heard of Castle Freeman Jr. before, but this book was well received and although it wasn’t really my cup of tea, it was weirdly compelling. This entry was posted in Book Chat and tagged 2011, literary fiction, page turner by Christie. Bookmark the permalink.